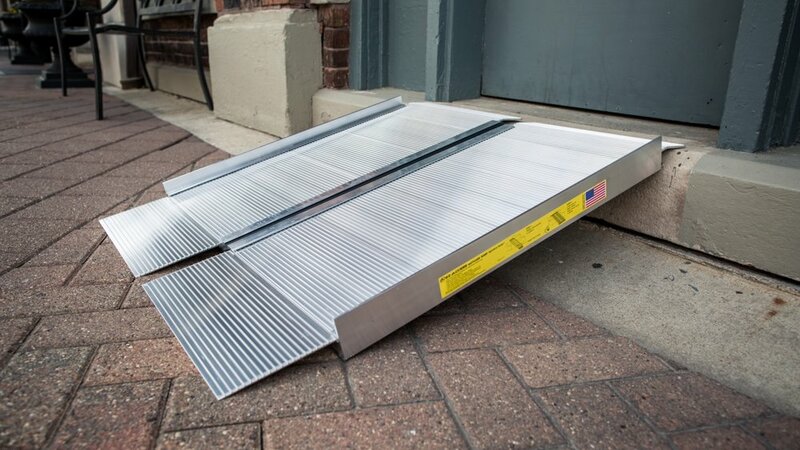 We offer modular aluminum ramps with or without handrails, custom concrete ramps, portable folding aluminum ramps, and threshold ramps out of aluminum or rubber. We offer multiple options. Aluminum, folding, threshold and custom. Are in stock and available in multiple sizes. You can add turns, connect multiple sections and add handrails. In cases where a standard ramp will not fit, we can customize a concrete ramp. These ramps are permanent. If you have a lower rise and don't require a handrail. A folding portable ramp might be the right solution. For those annoying small threshold that make it difficult to get through a front door. A threshed ramp might be the solution.